The most necessary and also often overlooked maintainance that you can do to a trailer is the seasonal service. There is nothing worse than being broken down on the side of the road waiting for a tow truck because you forgot to get your Spring Service done. Don't be that person stuck in the breakdown lane. 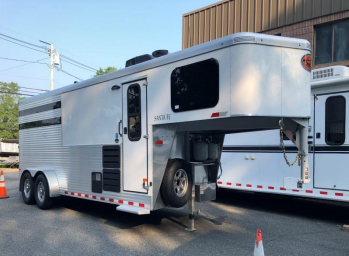 As a Massachusetts licensed DOT inspector and Rhode Island trailer inspector, we can make sure you can legally travel on the roadways. Be certain you are legal, call or come by today! We offer full customization and fabrication. Our professional and skilled welders can solve your needs for both aluminum and steel products. Please read our full guide of trailer towing safety recommendations and please call and talk to us about your own individual vehicle and trailer safety. We are an authorized dealer and installer of B&W Gooseneck Hitches. We also do D.O.T. Trailer Inspections, call now to schedule your inspection! What can we do for your trailer? We do trailer sales too! Inspect frame and flooring | Re-pack bearings, races, and replace seals | Inspect brake drums and hubs | Test all brake functions | Inspect tire wear and balance / adjust tire pressure | Inspect rims and torque lug nuts | Safety chain inspection | Inspect coupler or pintle ring | Lubricate all necessary locations | Inspect suspension: springs, bushings, shackles, etc. | Inspect hinges |Examine wiring to test light functionality | Inspect safety breakaway system.